It’s been fun going back to read Kenley’s weekly posts each time I sit down to write a new one for Crosby. It’s already apparent that they are very different, so I have to remind myself not to compare them. 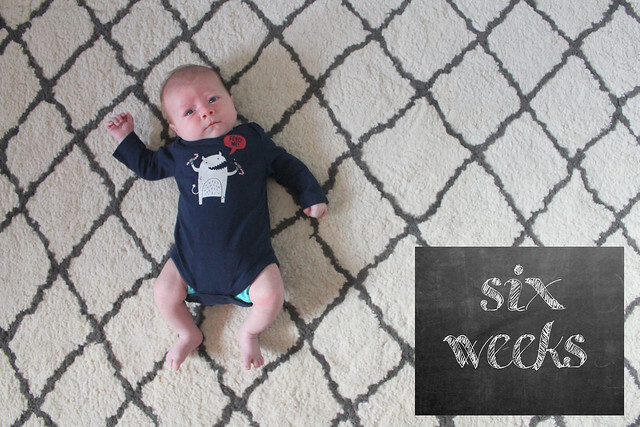 and also how the first six weeks were such a blur, which is not so true this time around. Obviously, having a two year old to keep us on our toes helps with that. Keeping up with two kids is hard, but I wouldn’t call the last six weeks a blur, even though they have flown by. Greg remembers being much more tired last go-around since we were adjusting to a completely different lifestyle. I, on the other hand, feel more tired this time and “mommy brain” is about a million times worse. I was good about “sleep when the baby sleeps” with Kenley, and not so much this time with Crosby. but by the time Greg and Kenley get home, the house is still a mess and it seems like I haven’t done anything. Crosby is already adjusting well in his role as the second child. whether that be at Target, in the car, or at Disney World. He is also taking all of the [sometimes aggressive] hugs and kisses from his sister very well. He still has a yucky head cold and he’s seen the doctor a couple times just to make sure it’s nothing more serious. As of Friday, he was 10 pounds, 13 ounces and is having no problem putting on the weight. Hopefully we won’t see the doctor again until his two month check-up.